Failure to delegate or failure to delegate effectively is costly – to you, your colleagues and, ultimately, your employer. There are both morale and productivity issues. It’s enough to make you cry unless, that is, you adopt the ‘onion’ approach which lies at the heart of the delegating process as described by Jon Warner in The Delegation Pocketbook. Think of your workload in layers, like those of an onion: tasks at the core need to be retained and more personal control exercised; those in the outer layers can be delegated, the more so the further from the core. To delegate effectively you need to understand your own attitude to delegation (a questionnaire in the pocketbook will help you here), what you can delegate and why you should do so (beware the wrong reasons! ), who to delegate to, how to prepare properly and what briefing style to adopt – controlling, tentative, participative or collaborative. Warner recommends aiming for the latter style, collaborative, which is achievable using the principles outlined in his book. There is advice too on setting goals/milestones, using controls to minimise risk, how to monitor the process, warning signs to look out for and how to react, and maintaining responsibility and accountability. Recognising the contribution made by others and learning from the experience are also covered. How well do you delegate and what style do you adopt: controlling, tentative, participative or collaborative? 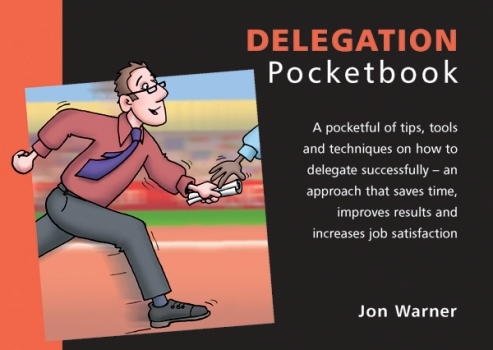 This pocketbook looks at the what, when and how of delegating – an insightful and practical overview.